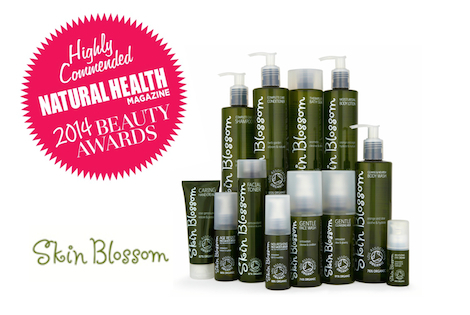 Cruelty-free skin care company blossoms with award ceremonies, prizes and a new look! It has been an exciting week for Skin Blossom. It started off with an invitation to the Natural Health Magazine awards at the Natural Product Show, where we were delighted to be awarded a Highly Commended prize in the Best Value Range. Winners included some of the huge names in the beauty industry, and the awards were judged by some of the top names in the sector. It’s a great achievement as our whole purpose is to make gorgeous organic, vegan skin and hair care that everyone can afford. With prices in our range from just £5.95 to £7.95 we hope you will agree the range offers superb value. The week got even better when we received the images for our new look and new products launching 1st May 2014. Our new products include a toner and bath soak, both of which are really effective and a delight to use. The new look now has most of our bottles being made from recycled plastic, as an ethical company it was really important to us to improve sustainability of our products. Hope you like the sound of it! It will be available on our website www.skinblossom.co.uk from 1st May, and from stockists shortly afterwards. Find out more at our website where you can see our full range of skin and hair care, which includes all you need for a basic organic, vegan skin and hair care regime.